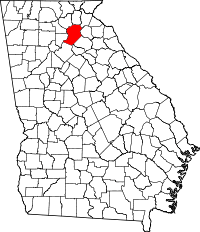 Flowery Branch is a city in Hall County, Georgia, United States. As of the 2010 census, the city had a population of 5,679. It is part of the Gainesville, Georgia metropolitan area, and lies on the shores of Lake Lanier. Flowery Branch was originally named Anaguluskee, a Cherokee Indian word meaning "flowers on the branch." Other sources claim the original name was Nattagasska ("Blossom Creek"), which long-term residents recall as an alternative nickname for the town. Andrew Jackson passed through Flowery Branch on his way to the first Seminole War in 1818. The Atlanta Falcons football team's training camp has been located in Flowery Branch since the start of the 2005 season. The city also hosts the Historic Caboose exhibit and the Historic Train Depot museum. Flowery Branch is located at 34°11′9″N 83°55′28″W﻿ / ﻿34.18583°N 83.92444°W﻿ / 34.18583; -83.92444 (34.185801, -83.924479). According to the United States Census Bureau, the town has a total area of 6.32 square miles (16.4 km2), of which, 6.32 square miles (16.4 km2) of it is land and 0.40% is water. Flowery Branch borders Chestnut Mountain and Oakwood. 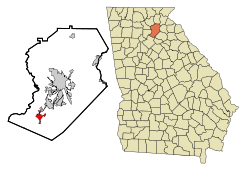 City limits are 1 mile (1.6 km) from Gainesville and Braselton. Flowery Branch is on the shores of Lake Lanier. As of the census of 2000, there were 1,806 people, 706 households, and 475 families residing in the town. The population density was 725.3 people per square mile (280.0/km²). There were 820 housing units at an average density of 329.3 per square mile (127.2/km²). The racial makeup of the town was 80.22% White, 10.18% African American, 0.44% Native American, 0.28% Asian, 2.21% from other races, and 0.66% from two or more races. Hispanic or Latino of any race were 9.69% of the population. There were 706 households out of which 33.3% had children under the age of 18 living with them, 43.6% were married couples living together, 17.0% had a female householder with no husband present, and 32.6% were non-families. 23.8% of all households were made up of individuals and 7.1% had someone living alone who was 65 years of age or older. The average household size was 2.56 and the average family size was 3.01. In the town the population was spread out with 25.7% under the age of 18, 12.1% from 18 to 24, 35.4% from 25 to 44, 18.1% from 45 to 64, and 8.6% who were 65 years of age or older. The median age was 31 years. For every 100 females there were 103.4 males. For every 100 females age 18 and over, there were 96.3 males. The median income for a household in the town was $35,478, and the median income for a family was $38,500. Males had a median income of $29,572 versus $21,382 for females. The per capita income for the town was $16,970. About 9.5% of families and 13.3% of the population were below the poverty line, including 13.1% of those under age 18 and 21.6% of those age 65 or over. Public education in Flowery Branch is served by Hall County Schools. Johnny O'Connell, a team driver of the Pratt & Miller Corvette team in international sports car racing. Phil Niekro is also a famous resident of Flowery Branch, a member of the Baseball Hall of Fame who pitched 20 seasons for the Atlanta Braves. Connor Shaw, previous starting quarterback for the University of South Carolina football team, currently plays for the Cleveland Browns also hails from Flowery Branch. ↑ Hopper, Buz. "Jackson at Young's Tavern". GeorgiaInfo: an Online Georgia Almanac. Digital Library of Georgia. Retrieved November 30, 2016.